ITC Infotech conceptualized and developed a next-generation automation solution designed specifically for the airline business. The solution enables automation of passenger claims and grievance redress mechanism. Traditionally, automation has been associated only with back-office processes with considerable system integration efforts. Robotic Process Automation (RPA), on the other hand, is non-invasive and mimics the actions of an end user at the user interface level. RPA is getting more sophisticated nowadays and Cognitive RPA powered by AI, ML & Analytics gives organizations a clear competitive advantage by significantly improving operational efficiency and cost savings. RPA can be leveraged in both core and support functions for better value realization. 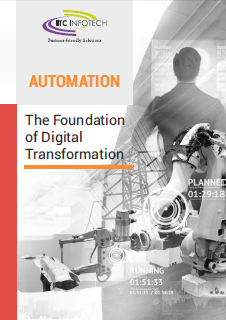 It is critical for RPA to be a strategic initiative for a successful transformation.